DocuSign is an electronic signature system for digital files. 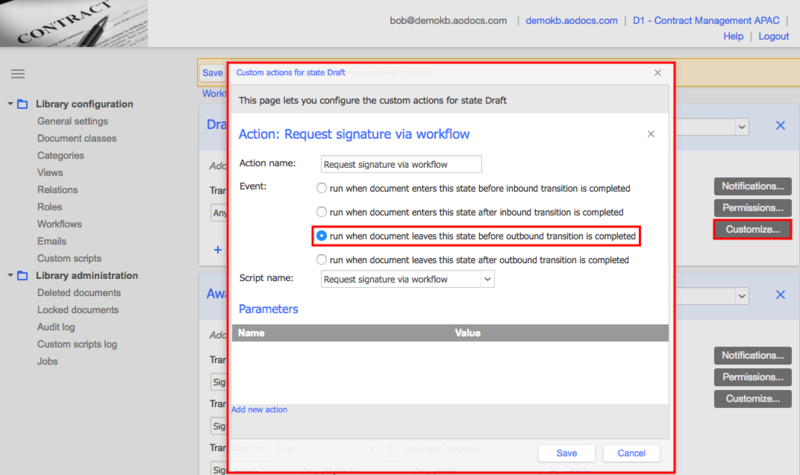 The AODocs-DocuSign connector can be used to sign the first attachment of an AODocs document in a Document Management library. Important: The AODocs-DocuSign connector can be configured only in Document Management libraries. When the file is signed, it is added to the current AODocs document as a new PDF attachment. The name of the signed attachment is suffixed by .signed.pdf. As a library administrator, to enable the electronic signature on your library, you need to configure several features. This article provides an example of a simple use case. 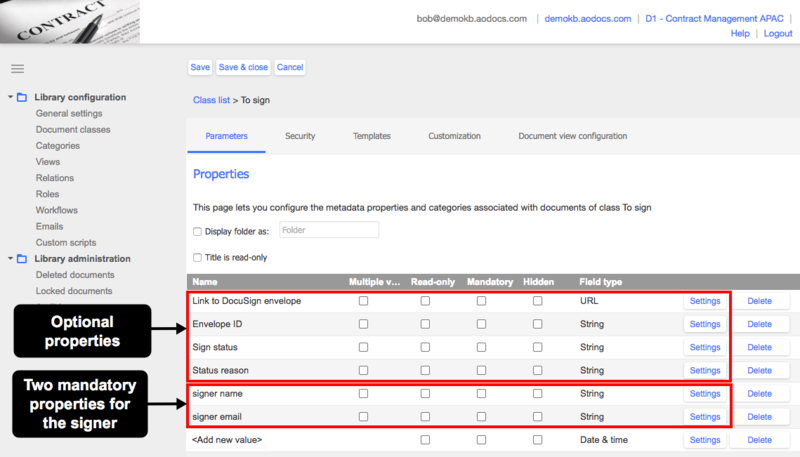 This article provides an example of the most simple use case for the AODocs-DocuSign connector, with one signer determined by property values in the document class. To find out about advanced features and how to customize this simple use case to meet your specific business requirements, contact your AODocs Sales Representative or send an email to sales@aodocs.com. 1. Open the library administration interface and select Document classes under Library configuration. 2. Select (or create) the document class for which you want to enable e-signature. 3. You must add two properties for the signer of your document on the Parameters tab of your document class. Notes: You will have to map these properties in the custom script you use. You must use exactly the same property names in the script as those defined in your library administration. You can customize the property names according to your business case. 4. Optionally, on the Parameters tab of your document class, you can add the following useful properties for tracking the progress of the e-signature process. Learn more in the article Configure custom properties. You may need to request access from sales@aodocs.com. Note: If you use the property Sign status in a workflow, it becomes mandatory. The other parameters are always optional, but recommended. Important: If you add these properties, they must be named exactly as specified. The property names are case sensitive. 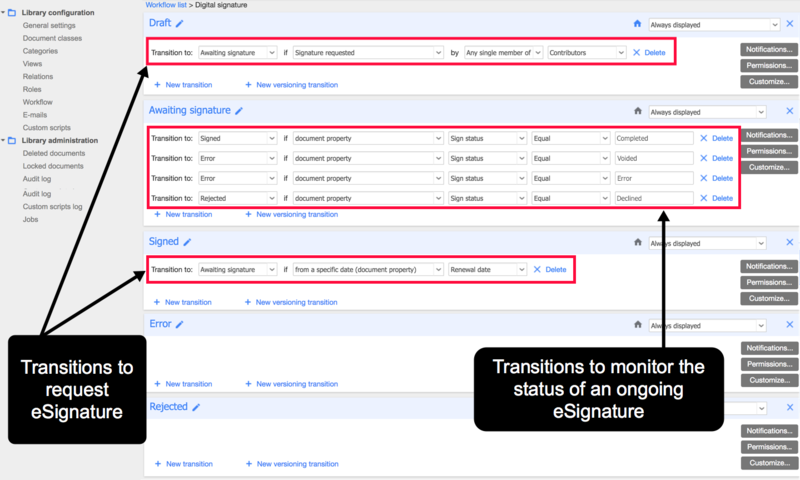 The DocuSign integration relies on custom scripts. Sample custom scripts are provided below, but you will probably need to adapt them to match your own use case. If you need assistance, contact your AODocs Sales Representative or send an email to sales@aodocs.com. If you’ve never configured custom scripts in AODocs, request access to the custom script documentation from sales@aodocs.com. 1. Create a new custom script. Define it as type Viewer Action or Workflow Action, depending on which custom script you want to use. Note: If you choose to trigger your e-sgnature through a Workflow Action custom script, you must also configure a workflow for e-signature. 2. Copy the code from the sample custom script into your custom script. Log into your DocuSign account. 4. In the section //// CONFIGURATION //// enter the properties for signers (name and email address) that you created in your document class. Important: The property names in the custom script must match exactly those in your document class. This means that the signer must sign the document at the location of the anchor. This is the default option. This means that the signer can sign anywhere in the document. If you created a Viewer Action custom script, the configuration is now complete. You can create a document for signature. Learn more: DocuSign Connector User Guide. If you created a Workflow Action custom script, you need to configure your workflow for e-signature. If you’ve never configured workflow transitions (or if you need to refresh your memory) read the article Configuration — Add workflow transitions. Below is a typical example of a workflow used for e-signature. Note: This example corresponds to the most simple use case. For a more advanced configuration specific to your business, contact your AODocs Sales Representative or send an email to sales@aodocs.com. Custom actions define how custom scrips are triggered. In our example of a simple use case, the custom script is triggered via a workflow. If you’ve never configured custom actions in workflow states (or if you need to refresh your memory) read the article Trigger custom scripts on workflow states. You may need to request access from sales@aodocs.com. 1. Press the Customize button on the workflow state from which e-signture will be triggered. In our example, this is in the Draft state, immediately before Awaiting signature. 2. In the pop-up, select Add new action. 3. Enter a name for the action. Note: The action name appears in the custom script logs when the custom script runs. 4. Select Run when document leaves state before outbound transition is completed. 5. In the Script name drop-down menu, select the custom script you configured. The configuration is now complete. You can create a document for signature. Learn more: DocuSign Connector User Guide.